Before entering into any financial agreement, you should be sure to assess the costs and net benefits. Below we are going to walk you through both the benefits and costs associated with factoring. Early-stage factoring exists mainly to support the growth of young companies when other financing tools are not yet available. A company with growth opportunities will find that factoring is a valuable tool. Finance: Typically, trade receivables take 30-60 days to be paid. Using a factoring line, a company can turn much of this idle paper into cash, and continue to maximize cash flow as product is delivered or services are performed. The dollar benefit is the amount of additional gross profit that comes from investing this cash into the growth of the business. It could go into a direct marketing campaign, radio advertising, sales force hiring, repackaging, relocation, web redesign, sales collateral, product enhancement, or promotional campaigns. However, to the young company with growth prospects, maximizing cash is critical to realizing growth, and planning the use of that cash is just as critical. The company may now expand the use of credit to its existing customers, where it was previously offering COD or limited credit terms due to cash constraints. Moving from COD to Net 30 terms can be a major growth milestone for a young company. Credit Services: A non-recourse factor will analyze credit and establish trade terms with regard to the company’s customers, then guarantee those credits. Because of the guarantee, the company may be able to do business with a wider spectrum of customers than before. The larger a company’s prospect list, the more likely that credit services will produce sales growth. Supplier Assurance: A factor will guarantee payment directly to the client’s supplier based on a completed, factored transaction. This “supplier assurance” can mean the difference between filling a large order and passing up business. In many cases, not only will a supplier agree to deliver the goods, but it may extend limited credit terms as well. Professionalism: A quality factoring company will establish a set of procedures with a client’s customers based on experience. An organized process for managing receivables sends a strong message to the customer that the company itself is professional and reliable. Administrative Outsourcing: Owners and executives of early-stage companies tend to be over-burdened by administrative tasks, including credit analysis, status checking, and collections. Outsourcing these tasks may free up executive management time to focus on company growth. Credit Services (non-recourse): Bad debt ratios (bad debt expense/revenue) for U.S. small businesses vary widely, across and within industries. A recent survey of 500 small companies by Dun & Bradstreet and Entrepreneur Magazine found the average ratio to be 2.7%, including cash and retail businesses. The only number that matters is the bad debt ratio of the client company. Unfortunately, emerging companies don’t have the history to estimate a reliable bad debt ratio, and the future cost of bad debt can’t be timed. Discussion with the business owner is often the best way to gauge a bad-debt estimate. Typically, a number of 1-3% will be used for analysis purposes. The benefit of factoring is that bad debt will be eliminated on all receivables that are factored, provided they are factored on a non-recourse (credit-guaranteed) basis. In some cases the cost of factoring can be justified based on this benefit alone. Suppliers will typically offer discounts for accelerated pay and for volume, effects of improved cash flow through factoring. However, the emerging growth company is usually better off investing cash in sales growth than in quick pay to suppliers. In most cases, the better cash position of the company will lead to better supplier credit, leading the company to even better cash position. This is a main goal of factoring. Credit Services and Accounts Receivable (AR) Management: The client can essentially outsource its whole credit and receivables department to the factoring company. The advisor should look at the potential cost reductions in personnel, credit reports, postage, and supplies. Typically, the larger the customer list and the smaller the average invoice, the greater will be the benefit of outsourcing this function to a factoring company. The cost of factoring is usually related to the dollar volume of invoices being factored and the average days turn on the paper. However, pricing programs vary across a broad spectrum. Generally, if the business owner can estimate monthly factored volume and the average days the customers will take to pay their bills, the factoring costs can be estimated. Additional costs will be detailed in the factoring agreement. Common additional costs may be: per-invoice handling charges, credit checking fees, chargeback fees, wire fees, postage, minimum monthly fees, and termination fees. It is critical to review a sample security agreement in detail and calculate total fees before making a decision to factor. Related to cost is the question of advance rate. Because a key purpose of factoring is to create cash flow, it’s important to note how much of the receivables will be held back in reserve in the factoring transaction. However, the lower-advance programs usually carry a lower factoring fee as well. This is due to their lower cost of capital and their lower risk. Generally, non-recourse factors will only guarantee credit to the extent of their advance. Because of this feature, the business owner should insist on carefully checking the factor’s credit (since in a factoring relationship, the factor will now be the company’s largest receivable account!). 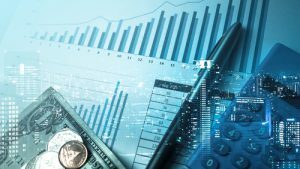 Today’s non-recourse factors in the small business market segment generally advance from 70-95% on the face value of the receivables they factor. Credit and Administration only: Most emerging companies utilize factoring for cash flow. However, it’s very possible, especially as they mature, that they’ll outgrow the need for immediate cash or will qualify for conventional lines of credit. In many cases, they’ll find the credit and A/R management features of factoring to be of ongoing benefit. Full-service factors can cost these separately to make sense within the company’s business strategy. As a reminder, the business owner should be armed with full pricing details regarding the factor’s program, and maximize its value based exactly upon the services needed. The benefits and costs can easily be quantified to aide in the decision. If you need cash today, factor your invoices with Riviera Finance. 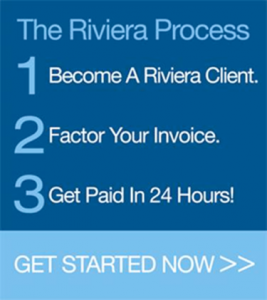 Find a Riviera Finance invoice factoring office near you!